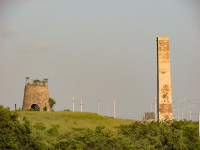 In her book De Los Bueyes al Vapor, Lizette Cabrera Salcedo states that this was the first wind mill installed in Guayama in 1827 while owned by Frenchmen Luis Rió, Luis Santa Clara Deville and Adriano Sanbot. The wind milll was imported and built by technicians from Saint Thomas. That same year, another windmill was established in Bayamón according to the inscription on the Santa Ana windmill. In the decade of 1840, then the 785 "cuerdas" Hacienda Carlota, was owned by Wenceslao Lugo-Viñas Oliver (1820-1883), a Spanish immigrant from the Canary Islands. In 1870 Lugo-Viñas acquired and incorporated Hacienda Buena Esperanza to Carlota. Prior to its purchase by Lugo-Viñas, Buena Esperanza had a steam powered mill that was destroyed by a fire in December 1867. By the 1880s Carlota had a total of approximately 1,000 "cuerdas" of which about 400 were planted with sugarcane. After Lugo Viña's death in 1883, his heirs (wife Eugenia Dausó Marguet and sons) lost the plantation due to poor administration and excessive debts. In 1891 Carlota was auctioned and acquired by Ignacio Diaz Joglar. In 1902 sugar processing was completely automated but by 1910 it had already shut down. The last two pictures taken in May 2015 show the remains of the windmill partially destroyed. We do not know the exact cause, but it is reasonable to believe that the crack seen on the first two pictures finaly gave way.